Congratulations to Simon Charette, Winner of Event 23: $3,000 No-Limit Hold'em Six-Handed ($567,624)! Early Monday afternoon, 924 hopefuls dished out $3,000 for Event 23: No-Limit Hold’em Six-Handed in hopes of turning it into fame and fortune – or at the very least to cut a profit. After three long and hard-fought days of six-handed action, it would be Simon Charette who took home the gold bracelet and the $567,624 that went along with it. Even with just 18 players remaining going into Day 3, it was still a stacked field with the likes of Bertrand “ElkY” Grospellier, Freddy Deeb, Andrew Lichtenberger, Eugene Katchalov and Scott Montgomery. Fun fact: combined – those five players alone have over $25 million in tournament winnings. The day started off fast and furious with six eliminations occurring within the first half of the first level of play. Katchalov was one of the early victims when he made a short-stack push with into Eddie Blumenthal’s . Katchalov paired his queen, however, Blumenthal would spike an ace on the river to sent Katchalov to the rail. The eliminations came a bit more slowly after that, but they did come. 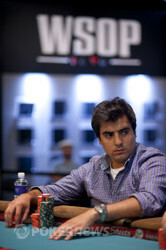 Freddy Deeb met his end in 10th place after he found himself dominated in a blind versus blind confrontation. Andrew Lichtenberger would bubble the unofficial final table after his pocket kings fell to the ace-queen of Artem Metalidi after getting it all in preflop. After relocating to the main stage of the Pavilion, the final seven players joined together onto a final table. Scott Montgomery would be the first to go after pushing a flush draw on the flop and whiffing. Not long after, Grospellier hit the rail after his could not hold up against Luis Rodriguez Cruz's . The pace of play slowed considerably following Grospellier’s elimination as no one left was particularly short-stacked and no big hands developed. 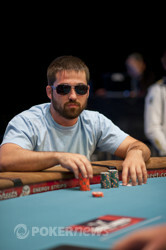 However, Simon Charette used this time to amp up the aggression and push himself near the chip lead during five-handed play. Foster Hays went out in 5th place shortly after dinner break when his failed to improve against Metalidi’s after pushing all-in preflop. Next to go would be Eddie Blumenthal, who ran his pretty-looking into statistically the worst-possible hand, aces, held by Charette. He failed to improve and was sent to the rail in 4th place. Luis Rodriguez Cruz was scrappy and managed to double during three-handed play, but he would eventually have to settle for 3rd place after his failed to hold up in a race against Charette’s . Heads-up play was short lived, to say the least – lasting just a few hands. 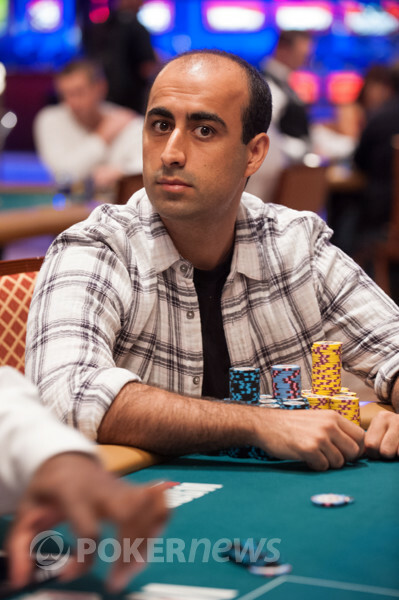 Medalidi’s fate as runner-up occurred after he six-bet shoved preflop and was called by Charette holding . The board didn’t improve Metalidi’s hand and he had to settle for 2nd place. Congratulations to Simon Charette, who has now bested his second-place finish that occurred last year during Event #48: $1,500 No-Limit Hold’em. Thank you from all of us here at PokerNews for tuning in and following along as we crowned yet another WSOP champion. Until next time – goodnight from Las Vegas! 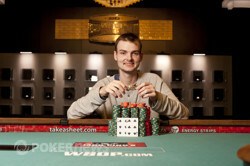 Simon Charette raised it up to 125,000 from the button and Artem Metalidi three-bet to 350,000. 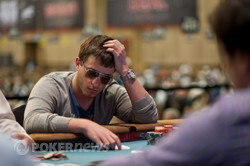 Charette still felt his hand was best and four-bet to 600,000. Metalidi moved all in and Charette made the call. The board came and Metalidi was eliminated in second place when his hand failed to improve. Action folded to Simon Charette on the small blind, who raised to 125,000. Luis Rodriguez Cruz responded by going all in from the big blind for his last million and Charette made the call to put Cruz at risk. .... ! which paired Charette's ace on the river and sent Cruz home in 3rd place. Artem Metalidi opened to 100,000 from the button and was called by Luis Rodriguez in the big blind. The flop came and Cruz check-called a 140,000 c-bet from Metalidi. The turn brought a and Cruz again check-called, this time a 240,000 bet from Metalidi. The river fell the and Cruz checked again. Not backing down, Metalidi led out for a hefty 500,000 bet. Cruz quickly called and Metalidi revealed a , causing Cruz to immediately muck his hand. Metalidi then showed his other card - the . Down to his last 600,000 following the hand, Cruz went all in from the small blind the very next hand and was called by Metalidi in the big. The board ran out and Cruz doubled through Metalidi back to 1,200,000. Simon Charette was the first player to act and put out a standard raise of 100,000. Luis Rodriguez Cruz was next to act and three-bet to 230,000 from the button. Next up was Eddie Blumenthal who four-bet to 620,000 from the small blind. Artem Metalidi folded the big blind as fast as he could, and Charette moved all in. Cruz folded, and Blumenthal made the call and was at risk. The board came and Blumenthal was eliminated when he failed to improve. Charette then took in probably the biggest pot of the night and sits just under 2,500,000. In the first hand, Eddie Blumenthal raised to 105,000 from under-the-gun and found one caller in Luis Rodriguez Cruz in the big blind. The flop came and both players checked, however, Cruz led out for 130,000 on the turn, which Blumenthal called. The river came the and Cruz led out again - this time for 180,000. Blumenthal announced a call and was incredulous when Cruz tabled for third pair. It was apparently good as Blumenthal mucked. A couple hands later, Cruz opened to 100,000 from the button and Blumenthal went all in from the small blind. The big got out of the way and Cruz made the call to put Blumenthal at risk. The board ran out .... , pairing Blumenthal up on the river and doubling him up to 1,500,000. Cruz has slipped to 1,900,000. It was battle of the blinds with Artem Metalidi making it 100,000 from the small blind. Simon Charette in the big blind completed the call. The board came and Metalidi bet out 125,000. Charette mandated it be 275,000 and pushed out a raise. Metalidi made the call and the landed on the turn. Metalidi made the call and Charette moved all in for 1,185,000. Metalidi was visible surprised and a little disgruntled by this revelation, and took his time before ultimately folding. Eddie Blumenthal opened to 85,000 and was three-bet to 180,000 by Simon Charette from the big blind. Blumenthal decided to flat and it was heads-up going to the flop. The flop came and Charette led out for 200,000 even. Blumenthal thought it over and announced he was all-in. Charette quickly mucked. Charette has been slipping and is now down to 1,800,000. Blumenthal is sitting on 1,400,000.